The party has not declared a candiate for the South Delhi seat. 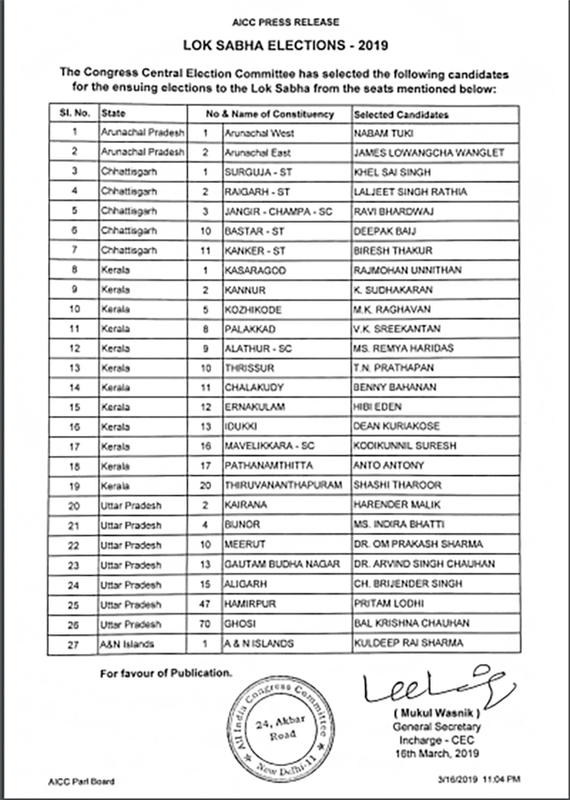 Sushmita Dev who is the chief of All India Mahila Congress has been fielded from the Silchar Lok Sabha seat as well as the Gaurav Gogoi from Kaliabor seat in Assam. They both are sitting members of Parliament and have been fielded from their corresponding areas. Senior SC leader P L Punia’s son Tanuj Punia has been selected to fight from Barabanki (SC) seat in Uttar Pradesh. The party has also designated Swarup Das from Karimganj (SC) as well as Sushanta Borgohain from Jorhat, both from Assam. 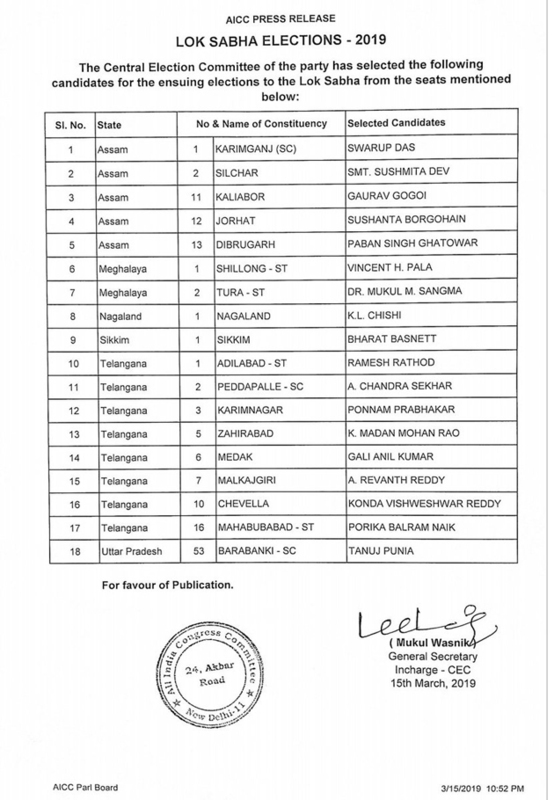 Also, K L Chisti from Nagaland and Bharat Basnett from Sikkim are also got nominated by the party. 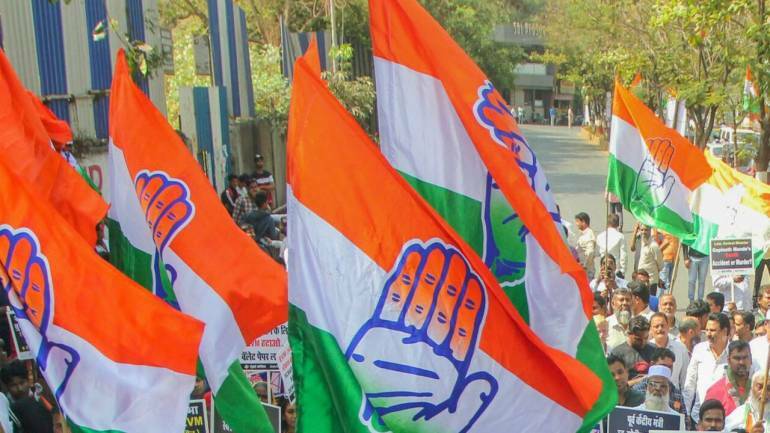 Those candidates from congress party who have been fielded from Telangana comprises of Ramesh Rathod (Dilabad), Ponnam Prabhakar (Karimnagar), A Chandra Sekhar (Peddapalle), A Revanth Reddy (Malkajgiri), K Madan Mohan Rao (Zahirabad), Konda Vishweshwar Reddy (Chevella), Porika Balram Naik from Mahabubabad and Gali Anil Kumar (Medak). 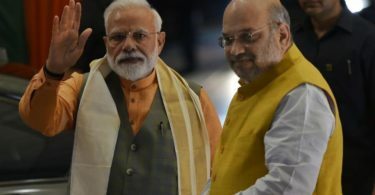 The Congress is facing a stiff challenge from the BJP and is hopeful of improving its tally in the Lok Sabha this time. In the previous general election held in 2014, the Congress had won just 44 seats. The party is holding hectic parleys with the regional political parties in many states to stitch an alliance but it has so far reached a consensus only with DMK in Tamil Nadu, JD(S) in Karnataka and JMM in Jharkhand. The Congress party has fielded Konda Vishweshwar Reddy, who earlier in the month of November last year resigned from the Telangana Rashtra Samithi, in Chevella constituency. However Telangana Pradesh Congress Committee Working President A Revanth Reddy will contest from Malkajgiri seat. The 2019 Indian general election is planned to be began from 11 April 2019 till 19 May 2019 in 7 phases to establish the 17th Lok Sabha. 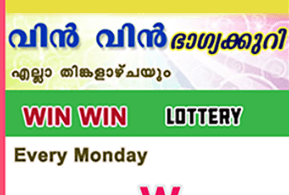 The counting of votes is going to be held on 23 May 2019 and the results will be announced on the same day as well.